The Los Verdes Golf Club in Palos Verdes marked the beginning of a new chapter for Lisa and Aaron. They have grown together, laughed together and made a beautiful family together. Two amazing people became husband and wife, with promises to love each other always. It was a celebration with their closest family and friends, but most importantly their children. A beautiful ceremony full of love, gorgeous details and their own theme song. The day began with the bride getting ready in her oceanfront Casita at the luxury Terranea Resort in Rancho Palos Verdes. Look at that gorgeous view while the bride relaxes with her bridesmaids. The Terranea Resort is one of my favorite wedding venues in Orange County. It makes for beautiful photography of the wedding day. The amazing team of Fuse Hair & Beauty did a fabulous job with hair and makeup for the beautiful bride and her ladies. The beautiful grounds of Terranea, were picture perfect as Lisa slipped into her stunning Mon Ami Bridal gown. Of course every bride needs diamond embellished Benjamin Adams heels, right? Lisa added elegant diamonds from Adorn Jewelry to complete her bridal look. The gorgeous wedding day florals were created by Flower Allie. Love the added touch of the diamond in the bridal bouquet. How cute is this little princess flower girl looking at Mommy's wedding dress? A wedding photo to cherish! This flower was from her grandmother's dress, was embroidered onto her Mon Ami Bridal gown. What a sweet way to incorporate a personal touch to the wedding day. 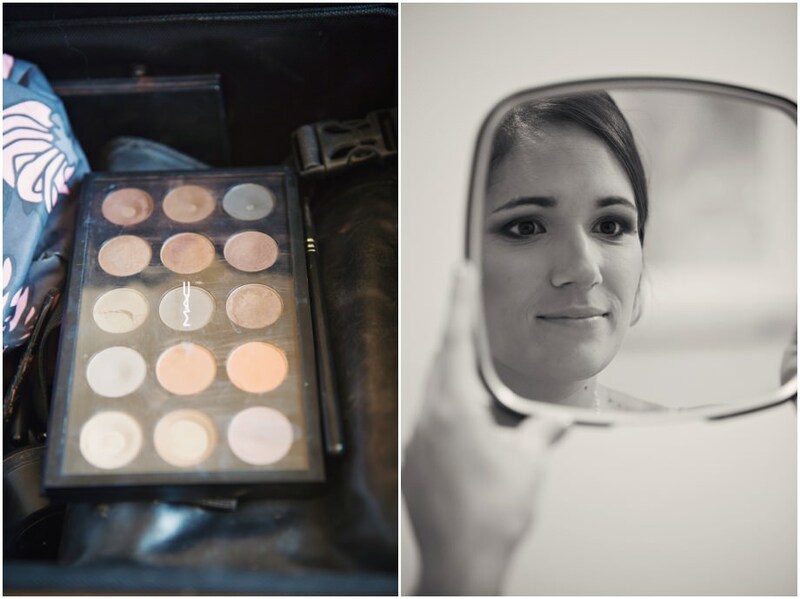 The stunning bride waiting to get married at the Los Verdes Golf Club. Lisa, you are gorgeous! The groom and his groomsmen looking sharp next to the Rolls Royce stretch limo from United Royal Coach. The finishing touches as Aaron awaits for his bride to arrive at the Los Verdes Golf Club. Lisa and her ladies looking fabulous in their purple bridesmaid dresses and fuschia bridal bouquets. 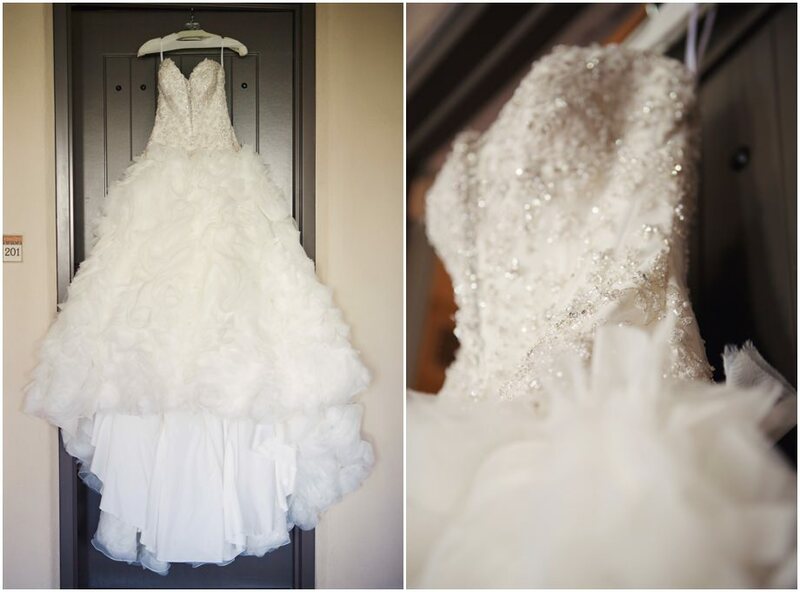 This diamond embellished corset Mon Ami Bridal gown looked amazing on the bride! The ceremony setup amongst the trees on the gorgeous golf course at Los Verdes in Palos Verdes. Look at the way those purple florals pop! Fuschia orchids and purple hyrdrangeas from Flower Allie hung from the arbor as the sheer fabric blew in the wind. What an adorable touch for the flower girl to play with Barbie Bride and Ken during the ceremony. We loved this amazing aisle runner full of rose petals, it made a statement! The groom sees his bride for the first time, as she walks down the aisle of the golf course at Los Verdes. The fabulous At Your Door Events team and the exquisite florals from Flower Allie, transformed the ballroom into a breathtaking and glamorous reception. Those gorgeous crystal candelabra's strung with florals and diamonds made for a dramatic centerpiece in the ballroom. These cute lantern favors not only added a beautiful glow to the reception but they escorted guests to their seats. This black and white floral and lace wedding cake from Great Dane Bakery was very chic! A lounge is a glamorous way to keep guests entertained during the cocktail hour and reception. Look at how the lights set the mood! Guest were encouraged to Instagram the photos they snapped throughout the day with their own wedding day hashtag. The couple had their first dance in the Los Verdes Golf Club ballroom. Always a special moment to capture! I'll end on this note...the bride and groom finished the evening by celebrating with their children watching a slideshow of memories. Thank you both for allowing us to document your wedding day, so excited for your future together. Alstrom's For Life!